Biological oddities, interests and observations from the world around us. 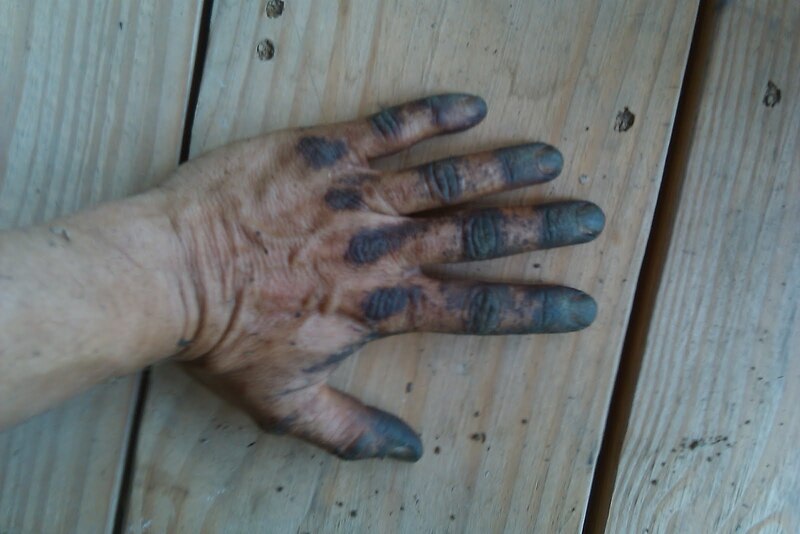 That black stuff is called tomato tar, and it builds up on your hands as you handle the green parts of tomato plants. It's thick and a little sticky, and some patches where it's especially thick have a greenish hue. When you try to wash your hands, it turns the water yellow! It also takes about 5 serious washes to get it off of your hands. 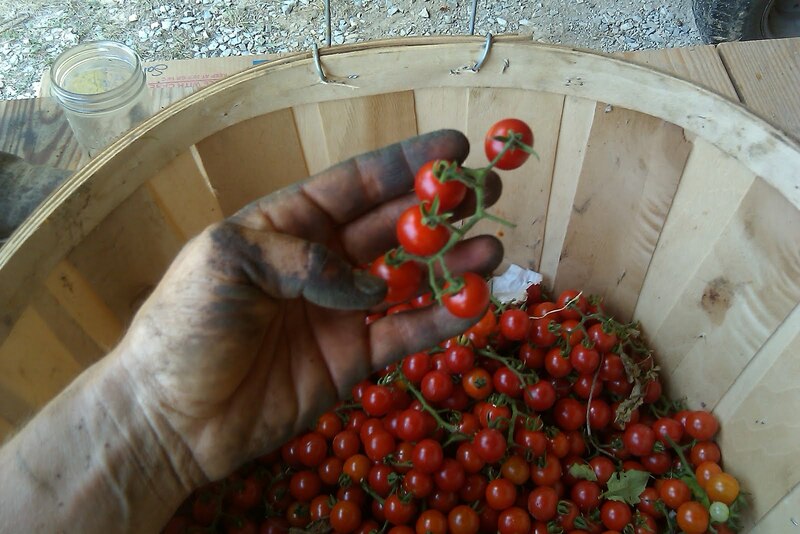 Matt's Wild variety of cherry tomato, and some tomato-y hands. Trichomes and proof that my hands eventually got clean. Under a scanning electron microscope, you can see that about half of tomato trichomes have a swollen structure filled with a yellowish secretion. This link connects to an image taken by a molecular biologist named Anthony Shilmiller whose entire career is studying tomato trichomes. In fact, he's part of a team of scientists who study tomato trichomes! The Solanum Trichome Project studies the structure, genetics and chemistry of tomato trichomes, and they can be found here. Now before you call your congressman about how much money is wasted on paying multiple scientists to study tomato hairs, please read a little further. Glandular trichomes of tomatoes can produce a variety of substances, depending on the genetics of the plant. Those substances can influence flavor, deter insects, prevent plant disease, and smell incredible (or terrible, as the case may be). Since the total value of the 1997 US tomato crop was $1,246,843,000,(source), and the value of tomato crops depends on flavor, insects and disease, you start to get a sense of the value in being able to use tomato trichomes to one's advantage. Most plants have trichomes. Aromatic herbs like mint often produce their wonderful-smelling oils in glandular trichomes. Trichomes can also be hair shaped without a gland. These can help leaves shed or retain water or deter insects. Trichome shapes can vary widely. In fact, as a last resort, many leaves can be identified by their trichomes. Tomato trichomes have another use that we can take advantage of. If you place a leaf or three in broth or stew or anything you want to taste like tomato, you can enjoy a very intense tomato flavor. Just add the leaf as you simmer and remove it before you eat - like a bay leaf. The trichomes burst and release their oils into your broth as it simmers. Amazing pictures. Is there any research to see if tomato trichome has medicinal benefits? I haven't been able to find information about medicinal properties of the oils in tomato trichomes. However, including tomatoes in one's regular diet has been demonstrated to reduce the risks of cardiovascular disease and many cancers. I just did a search for this, & found your post. Thanks for clearing up why I have black hands after working with my tomatoes! Same here. Black hands. Some say that rubbing a half green tomato onto your skin will remove the stain. It did nothing to my hands. So just wait. I kind of like it :) Thanks for the interesting article. For the 2012-2013 school year, Biological Thinking will investigate scientific phenomena occurring at an outdoor classroom in Nashville, TN. Even in a tiny patch of wildlife-friendly space, nature provides infinite wonders to observe and learn about. Older posts investigate biological oddities from around Nashville and from the author's travels.